Thread: 2018 Volkswagen Golf Alltrack First Test: Love-Hate Trek Across the U.S. This is the kind of combo that appeals to auto writers: a VW Golf but served up as a wagon. British racing green was just icing on the cake. So we were excited to put some miles on the 2018 Volkswagen Golf Alltrack, and by miles we mean a trek across a big chunk of the U.S., including the massive states of Wyoming and Nebraska. The ride included Midwest snow and cold; hills, mountain passes, and flat highways; and finally arrival in sunny California. When your test has such a wide broadband, you come to appreciate things like comfortable seats, a power panoramic sunroof, and VW?s 4Motion all-wheel-drive system. The Alltrack does not have a heated steering wheel, which we sorely missed. Fortunately the front seats are heated with lots of support, including manual lumbar support, although after time the seat belt can dig into your hips. Much of our driving was straight, but when we did find some corners, the Alltrack met our expectations of being fun to whip around, with no body roll even with its 1-inch lift. The wagon retains the steering feel of the Golf hot hatch. And on smooth interstates, the VW was fine but was beset with a lot of wind noise. But the raised, four-wheel independent suspension serves up a stiff ride. Sporty has gone too far when you can feel every dimple in the pavement. The suspension bottoms out on bumps, sending the impact into the cabin with enough force to rattle your teeth on uneven surfaces. 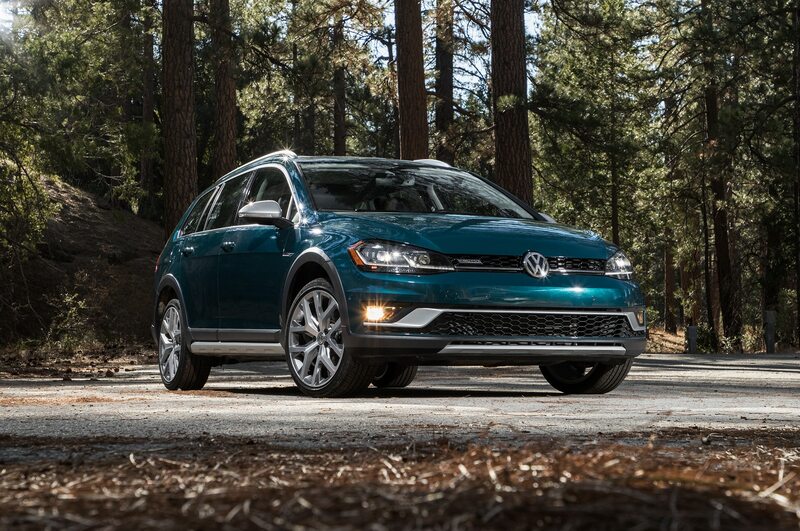 The Alltrack is powered by VW?s 1.8-liter TSI direct-injection turbocharged four-cylinder engine, which generates 170 horsepower and 199 lb-ft of torque and feels its peppiest around town. It pairs with a six-speed twin-clutch automatic transmission that stutters a bit in stop-and-go traffic until you get used to it. It was on the highway that we would have liked more power to propel this 3,510-pound vehicle. Our tester needed 7.1 seconds to go from 0 to 60 mph; the 2018 Subaru Outback 3.6R did the distance in 6.9 seconds, and the larger Buick Regal TourX wagon did the scoot in 6.3 seconds. The quarter mile was also strenuous for the Alltrack, clocking 15.5 seconds at 87.8 mph. That compares with 15.2 seconds at 95.9 mph for the Outback and 14.7 seconds at 94.7 for the Regal wagon. Real MPG came to 21.3/31.4/24.9 mpg in city/highway/combined, which was pretty close to the EPA-certified 22/30/25 mpg. The VW can lag off the line momentarily until the boost kicks in, and it quickly runs out of breath when you ask for anything more than moderate acceleration, notes features editor Christian Seabaugh, who describes it as ?borderline underpowered,? especially when passing. Associate editor Scott Evans noticed the unwillingness to downshift on flat highway cruising but the need to downshift a few gears to maintain speed on the steep path through the mountains. On some snowy off-road hills, we appreciated the 4Motion AWD with active control, and hours of highway driving were aided by the radar cruise control and lane assist. The interior, with its brown leather, felt warm and relatively upscale. Its heavy doors slam with authority. But there is also a bit of a spare feeling, and the black-and-white info screen on the gauge cluster does not help. I have a 2017 Alltrack and the wind noise is significant, especially at speeds over 50MPH. It's so loud that it makes conversation in the car challenging. Is anyone else having this problem? any suggestions? The dealer has not come up with any solutions. Is it truly wind noise or combination of other noise? Can you isolate where the noise is coming from? It would simplify diagnosis if you can point the noise to a particular location. If it is wind you can use painters tape to seal any gaps to tell if it makes a difference. Especially if you have a sunroof as there may be a defect with the installation of some sunroofs. I think some dealers may be able to do a pressure test to see how much outside leakage you have. It may be combination of wind plus tires, bearings, etc. you can move tires around to see if that makes a difference. Since your car is new I would find a good dealer and ask them to solve it for you. Assuming they are willing to work with you and have the right tools. I would second A&Hs comments. The AT is a relatively quiet car. This may sound dumb, but are all your windows rolled up and sunroof completely sealed/closed? I had an old Golf that had a rack on it, and with the sunroof open, the sound it made fits your description. I later added a fairing which helped. If it's a bone stock car, then something isn't sealed right. Have you sprayed the car down? It would seem if air is getting in, the water would get into the same gap(s). Good luck and let us know what you find. Thanks for your responses. The noise is absolutely wind. The dealer has worked with me and tried a few different things to see if it would help but nothing has made a difference. He even duct taped around all the doors! All the seals seem to be fine as well. I had considered there could be a defect in the actual windshield, but since it’s a new car I assumed it was not an aftermarket. I’ll ask them to look at it closer as well as the tires. I’ve really come to dislike the car at this point. Unfortunately, there are so few options out there for manual drivers these days, I feel a little stuck. Thanks again. Typical Motor Trend. They lost all credibility when they started off by talking about "brown leather," and then by unfavorably comparing it to a Subaru with a 3.6 litre boxer 6, an engine more than twice as big but only delivers a 0.2 sec advantage. Sounds like confirmation bias to me, or laziness, or just characteristically poor Motor Trend writing. Poor man, couldn't make sense of the navigation system. Perhaps he needs to give up his Star-Tac and get a phone with an interface from this decade. And we wonder why VW doesn't send us their good tech. The morons at Motor Trend just confirm that we are a nation of undeserving idiots. Last edited by Frances' Dad; 06-05-2018 at 06:57 AM. Well I just picked up a 2018 alltrack sel, it's very quite compared to the 2010 accord I traded in. I even bought goodyear comfort tread tires trying to reduce noise levels, but no luck. I drove 2 hrs away past 4 vw dealerships to get the car I wanted so i drove it home and was pleased on the fact i could talk to the wife with out having to yell at each other. and we even have the cross bars on top. Bu that just my 2 cents.